One of my favorite tools for finding useful (or sometimes useless) facts has always been WolframAlpha.com. 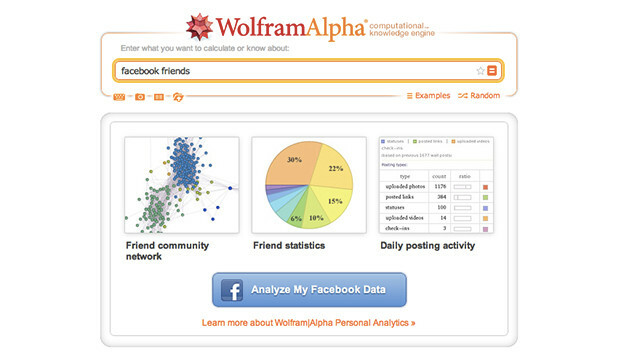 If you use Facebook check out www.wolframalpha.com/facebook. This tool analyzes the data in your facebook account and gives you a really fascinating insight into yourself, your social graph, and really just how strong your facebook addiction truly is. I know, I know… It’s been forever and a day since I’ve posted something here on the site, and I have received a ton of emails from you guys asking WHERE ARE YOU???. Unfortunately (or fortunately, depending on how you look at it) I have been super crazy with work lately. Part of my job at my new company is to create video’s similart to Tech Tip Tuesday targeted at the business professional. To be perfectly honest I’m not sure when I will be returning to put out more Tech Tips but I can assure you that I AM missing the interaction that I got from all of you. If you are feeling like you just aren’t get your Tech Tip fix and would like to check out the other video’s I’m producing I encourage you to check out http://www.pics-itech.com/category/itech-insights/. I would love your feedback and would love to hear from you. Remember these videos are aimed more at business professionals but I can assure you they are still delivered in plain English without a lot of geek speak, I know you’ll learn something from watching them. I look forward to eventually getting back to doing Tech Tips but for now please do check out my other video’s. You can watch them at the link I mentioned above or by going to iTunes and searching for ITech Insights. As always thanks for watching, and for all of your kind emails. First and foremost I would like to thank all the fans of Tech Tip Tuesday for all of your kind emails letting me know how much you’ve missed Tech Tip. I am trying to come back slowly with what I think are a little more personal, laid back style Tech Tips of stuff that I use and love. Nothing drives me more mad than sitting on hold when I’m trying to get help with something or I’m trying to get some “Customer Service”. In this, the return of Tech Tip Tuesday, I’m sharing a great service that has made that wait time a thing of the past. Special Thanks: To the students of HVA thanks again for the awesome gift you guys are a real motivation to me, and are in no small part, my reason for trying to figure out how to get Tech Tip Tuesday back on the air… or maybe I should say back on the web. Not Dead, Not Forgotten, Returning Soon!!! I have received so many kind emails over the last few weeks from viewers asking where I am, am I ok, is Tech Tip Tuesday dead? I’m pleased to tell you that NO I am NOT dead and neither is Tech Tip. Due to a recent new position I have taken I have been extremely busy and because of this Tech Tip Tuesday had to take a back-seat for a few weeks. There are some exciting changes coming down the pipe with a new sponsor and some changes in terms of content in the not too distant future. While I have been away for a few weeks I haven’t been sitting idle. If you’d like to see what I’ve been working on check out http://www.pics-itech.com/insights to see another podcast I’ve been working on for my company. Thanks so much for being a fan of the show and for all your kind words. I look forward to being back on soon with lots more Tech Tip Tuesday. Today I am quite literally giddy with excitement, this week is what amounts to the superbowl for geeks the Consumer electronics show in Las Vegas Nevada. Each year at the beginning of January CES kicks off the year with all of the newest gadgets and gizmo’s which are on the horizon and this week I’ll be giving some insight into what might be the next big thing and more importantly telling you some of the best places to learn more about what’s being unveiled right now in the world of Tech.